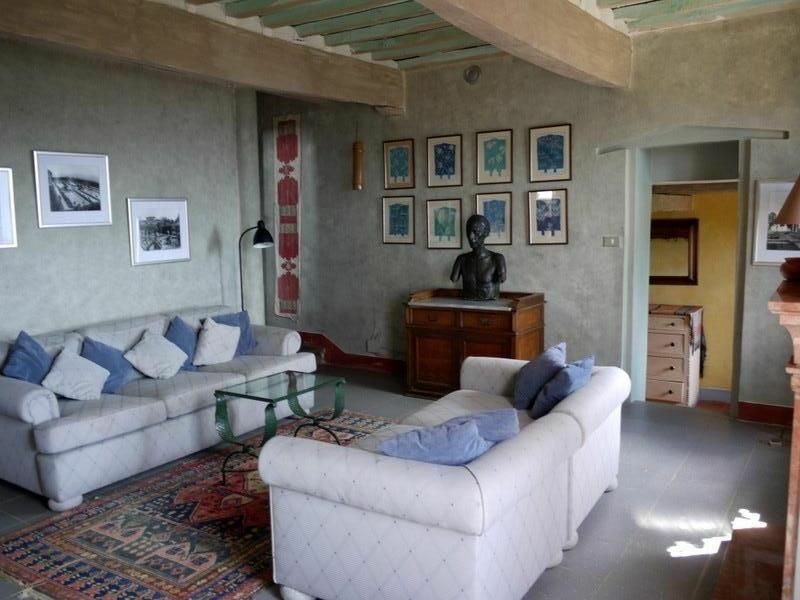 A delightful and very comfortable house in northern Tuscany, covered with purple bougainvillea in the summer months, standing at the end of the cluster of stone houses that form peaceful Peralta, a medieval hamlet restored by a sculptor. An inspiring, romantic and unique place. The rooms of La Foresteria are all large with high ceilings and are very attractively decorated and furnished. The dining room has hand painted motifs all over the beamed ceiling. All rooms and the terrace have stunning, panoramic views over the valley towards the hills and the sea beyond. the ground floor has a large dining room with fireplace and covered terrace with barbecue, ideal for eating out. The kitchen has all necessary equipment and leads off the dining room.. There is a bathroom with hower, WC. etc on this floor. First floor comprises a very comfortable living room leading out to a large terrace and panoramic view over the valley towards the sea. There is a bedroom with 3 single beds, two of which can form a double bed, a bathroom (bath) and WC. The top floor has a huge double bedroom - lovely beamed ceiling - en suite washroom/WC and the same fantastic view as the floor below. There is the possibility of adding a third double bedroom with its ensuite bathroom (shower). This room has its own entrance off a small terrace. The beautiful peaceful hamlet of Peralta has a spectacular setting in the Tuscan hills that rise high above the valley of Camaiore. It was restored over a period of thirty years with great love and imagination by international sculptor Fiore de Henriquez. She created a place that is quite unique. Peralta was her home up to her death in June 2004, and one can see her work all through the hamlet. Her sculpture everywhere, and the manner in which she restored and designed the hamlet, give it very special atmosphere and character. With stunning, panoramic views over the valley to the hills and sea beyond and surrounded by terraces of olive groves, its stone walls covered with purple bougainvilleas, lemon trees, jasmine, Peralta seems like paradise. There is a swimming pool on one of the upper terraces, a tranquil spot with a panoramic view towards the sea. The large terrace in front of Peralta is a lovely place to sit with a glass of wine, enjoy the sunsets and meet other guests. Access:: Airports: Pisa 45 mins - Florence 1 hr. Genoa 1 hr.40mins - Bologna 2hrs. From the A11 and A12 motorway exit, Viareggio/Camaiore, you head for 'Viareggio, Lido di Camaiore'. Then for 'Camaiore'. From Camaiore, there is a little road that leaves the valley and winds its way up the hill to Pieve di Camaiore, then to Peralta. (We give detailed directions). International sculptor Fiore de Henriquez was living in the area of Camaiore from the 1960's due to its proximity to the Carrara marble quarries and the bronze foundries of nearby Pietrasanta. In the 1970's she found the small hamlet of Peralta, perched on the hillside above Camaiore. It was remote, served only by a footpath, and the buildings were mainly in ruins - their inhabitants having left in the mid 1950's due to the hard living in the hills. No water nor electricity at this time. Fiore fell in love with the hamlet and managed to gradually buy the various houses. She then set about restoring them and the hamlet and created the very unique place that exists today. She died in 2004 and the hamlet was then taken over by a very good friend of her's who is the current owner. . Repairs and renovations are undertaken where necessary, but the essential essence of the hamlet remains the same as when Fiore was alive. It is the home of her archive and sculptures, which can be seen throughout the grounds and in the various accommodation, of which La Foresteria is one. The house is let by the night with a minimum stay of 4 nights in July and August and 3 nights at any other time. . This was a truly beautiful place to stay. Our house for the week, Foresteria had so much character, and felt so much more than a holiday let. It felt like an artistic and Inspirational home to think, draw, rest, eat and play (our 3 boys aged 4, 8, 11 loved it) The views were stunning and many evenings were passed staring into the valley, watching the lights, or looking at the amazing sky. The initial hair raising ride up to Peralta is well worth it!!! we really enjoyed the home cooked food, so tasty, from Laura, which was a welcome change from cooking ourselves and eating out. The sculpture tour of Fiore's work was inspirational, and a real highlight of our stay. The pool and its views were just sublime. The Peralta is a gorgeous place to stay, and Foresteria its most beautiful accomodation. Thank you to Kate and the team. Peralta is a hillside hamlet situated in the northern part of Tuscany, on the slopes of the Alpi Apuane (national park), 10 min from the market town of Camaiore in the valley which, in turn, is 10 min inland from the coast. It is an exciting area to explore: you can spend the day in the mountains or go to the sea. The proximity of the Carrara mountains and the bronze foundries of Pietrasanta has made the area a favourite place to live and work for sculptors and other artists. The hills and mountains around us are wonderful for walking and hiking in spring, early summer and autumn. Botanists are always excited by the range of wild flowers and bulbs. Tourist Attractions: The beautiful walled city of Lucca is a 35 min drive to the south.. The A12/A11 autoroute exit takes 20 min, making day trips to Siena (2 h), Carrara & its marble mines (45 min) very easy. the closest is Viareggio, the most popular Forte dei Marmi (35 min or so). The Cinque Terre are one hour away - one can drive to La Spezia or Porto Venere and visit them by boat - the ferry service is frequent. Shopping in the area (Lucca/Florence/Forte dei Marmi) is legendary! The sculptors' town of Pietrasanta is only 20 min away. Peralta is Ideally situated for the Puccini Festival (40 min away). Open air opera Festival taking place on the edge of a lake in July and August at Torre del Lago. Peralta feels wonderfully remote and secluded and yet is, in fact, very accessible. In the daytime, there is always someone on site to help with all inquiries regarding day trips, ferry times, advice on this and that. Airports: Pisa 45 min, Florence 1 h, Genoa 1 h, 40min - Bologna 2 h, Milan 3 1/2 h.
www.peraltatuscany.com for details of these.